Down three spots! I’m dropping fast in the rankings for Best Overall Blog on the Baltimore Sun website! Please remember to vote for me today. Voting ends in three days. I’m nominated for Best Personal Blog, Best DIY Blog and Best Lifestyle Blog. After voting in these three categories, you can type in Miss Celie’s Pants to vote for Best Overall Blog. Wouldn’t it be GREAT if the best overall blog was about sewing? Remember, you can vote once a day, each day. As I mentioned last week, this Sunday I’m going on the DC Tweed Ride with Trena and Liz. I planned to make Burda’s October 2008, #101 cape from a black and white herringbone. Friday night I was all traced and cut out with interfacing completed. Saturday I went to sew and realized I forgot to cut out the center front pieces and was totally and completely out of fabric. GRRRRR!! I went into the stash and pulled out this blue wool from the Carol Collection. This is actually kind of fortuitous as I really thought the herringbone needed body from underlining, but just didn’t have the time or energy for it. This blue was block interfaced while I was in NYC last November. The color isn’t very Tweed Ridish. But, it’s definitely more ‘me’. Here are the buttons I’m going to use. They are appropriately British looking. The basics are together, including the facings sewn in. Because it’s fused , I’m going to have to line it. Something I wasn’t planning on doing with the herringbone version. I may even seek out some flannel back satin or flannel interlining to up the warmth factor. Happily, I have Friday off for Veteran’s Day and can finish most of it then. Gah. I wonder if I can also squeeze in a skirt…. A very pretty new contender. Now you’ll have two blue coats. How cool to sew for a bike ride, I would love to do that 🙂 So, what did you do/are you going to do with the already cut herringbone? 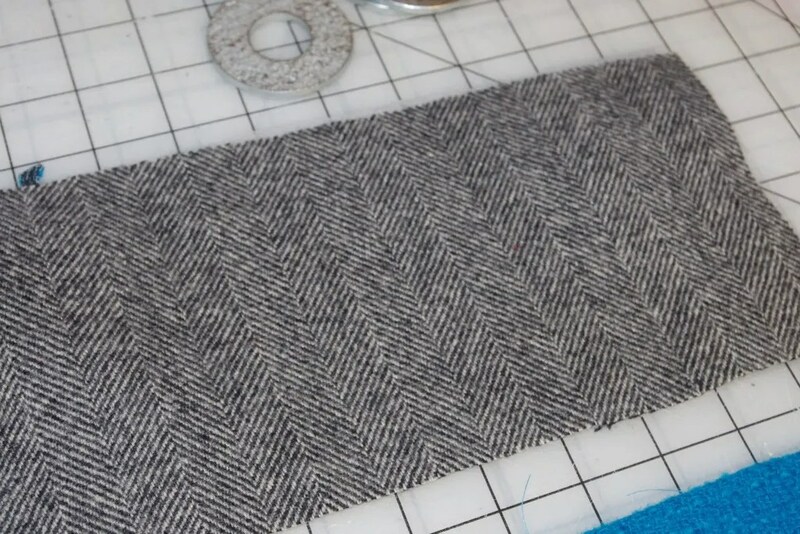 I was thinking of a rakish tweed newsboy cap… that is, if you wanted to use it in another project. 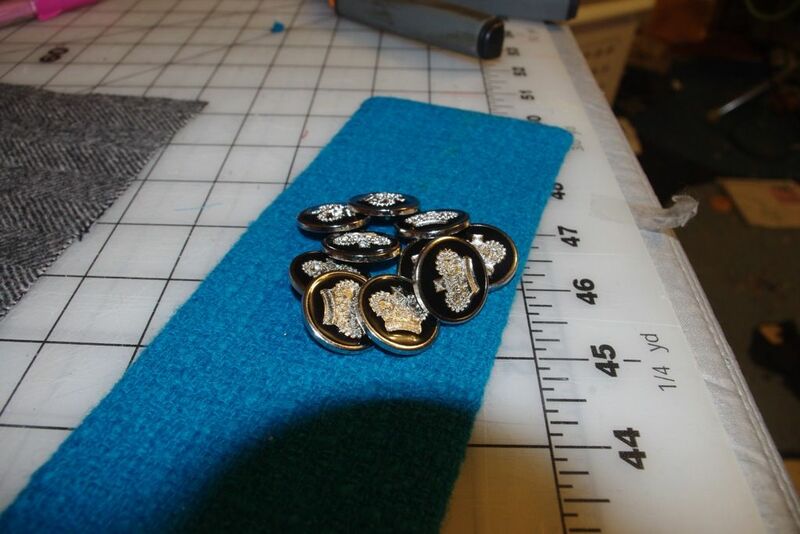 I like the British Crown buttons! I love the turquoise wool. It’s going to look fabulous on you. and those buttons are TDF! very pretty, can’t wait to see the finished product. I’m voting…I’m voting…but how do you know where you stand in the rankings? On the front page of the Mobbies, there is a standings list. It shows who is in first place for Overall and if your votes are up or down from the day before. I appreciate your votes!! I am voting too. It took me a couple of days to figure out the entire voting system, but I’m voting. Love love love that color!!!! It’s a fabulous color and it hits the very current trend for brights. 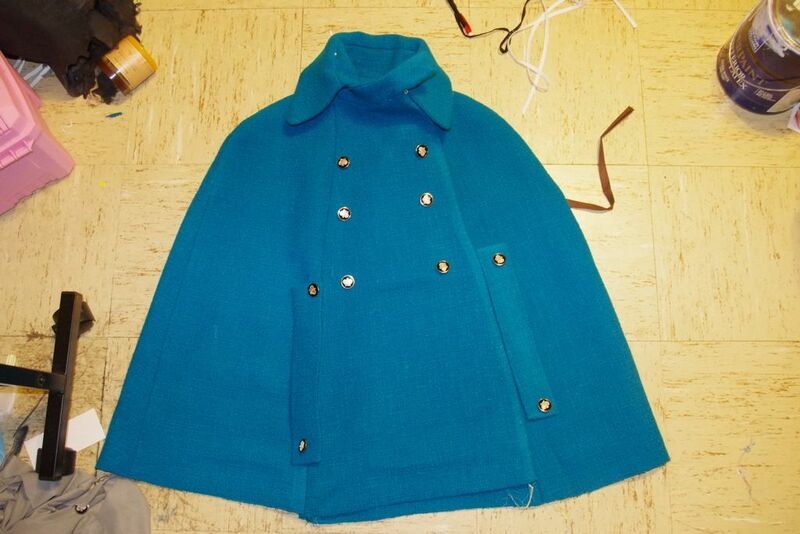 That it one fabulous blue cape. Much better than the tweed. 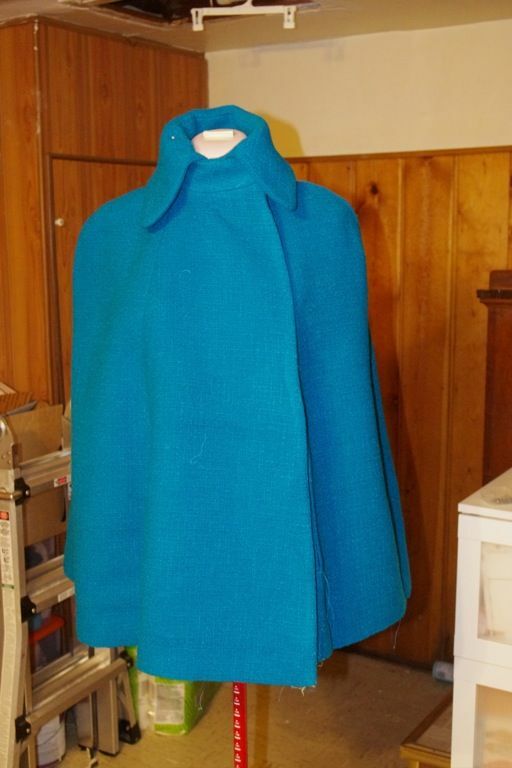 I always love the cape patterns when they come out in Burda, but I am yet to make one up. 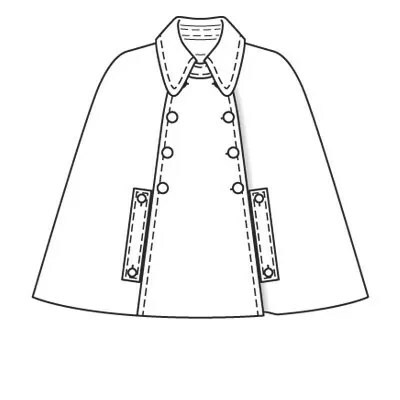 I like this cape pattern. And even though the other fabric suits the motto better, this color is very you. Looking forward to see it finished! Capes are so in this season. What a great color!